Ok then, I’ll go with KB. He needs to establish himself as our #1 and develop chemistry with Allen moving forward. No doubt KB needs to step up. 7 passes his way and 1 catch. Was it 2 or 3 drops? 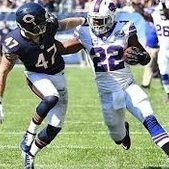 Buffalokie will have the most catches this Sunday! I will come home with no less than 10 catches for 40 lbs, and I am being way, way, way conservative. Probably more like 40 catches for 10 lbs, lol!!! I’m sure I’ll do it too. It’s just so natural. Really. The Croom always rises to the top! I would love for them to open the game like that 1st preseason game vs the Panthers when KB had 3 catches on 4 targets and a touchdown on the 1st drive of the game. I would love to see 10 to 12 catches on 15 targets and 2 tds this week to KB. Clay. Allen will work the middle of the field. Better not be Keenan Allen again, that made me sick last year. Zay? Really? How is he in the lead? I feel like Bills fans just enjoy being disappointed... The guy who caught only what, 35% of his passes last season, and a rookie QB playing behind an awful O-line are somehow going to be the most frequent connection? Sure. Why not? The problem is that in order to get that many touches, we need to have sustained drives & the offense out on the field. There's no way Shady gets 25 touches & the other RB's 10-20 themselves if we just keep going 3 & out all game. Zay﻿? Really? How is he in﻿ the lead? Only because he had the most catches Sunday with 3 and 6 targets. Is this a single digit or double digit count of receptions ? Shady will have double digit can't say for the rest of them ?? You forgot Nate isn’t playing. Go for a darkhorse not listed, Foster if he can hold onto it.